Embracing new trends is a significant focus for the team at Ikon each season with centring round high fashion collections from New Zealand, Australia and Europe. The established boutique store in Arrowtown’s Buckingham Street is a local fashion leader. “Our denim is pretty incredible with jeans by Ksubi, LTB, Diesel, Dr Denim and Scotch & Soda. Styles include the classic Ksubi black spray ons through to Diesel joggers which are super popular now, being a lighter weight denim,” says Caroline. The store has one of the largest ranges of Dr Martens boots and shoes and represents New Zealand’s most successful shoe designer Kathryn Wilson, stocking her brand, Miss Wilson. “We have just added Italian Superga fashion trainers, flatforms and slides to the collection this season. 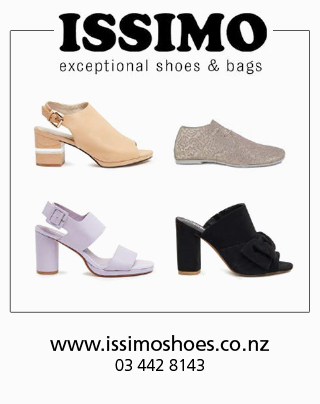 It’s footwear that suits smart casual dressing when you don’t want to wear a heel.” Eyewear by Quay, bags by MOOI, Silk & Steel jewellery and Brixton Hats complete the Ikon look. PARTY SHIRTS Party pastel shirts and matching shorts by Barney Cools are big news for spring and summer. Think the old school ‘Hawaiian’ shirt revisited for an attention grabbing look. SUPERGA Lots of colourways and prints feature in the new range of Superga at Ikon. MISS WILSON The striking spring collection by Miss Wilson features a combination of matte and metallic leather with gold detailing. C&M C&M has unveiled a new logo that sits smaller and higher on the front of tees and long-sleeved tops. Subtle but very cool. SUMMER DENIM Get the IKON look with amazing denim styles in lighter colours, perfect for summer.